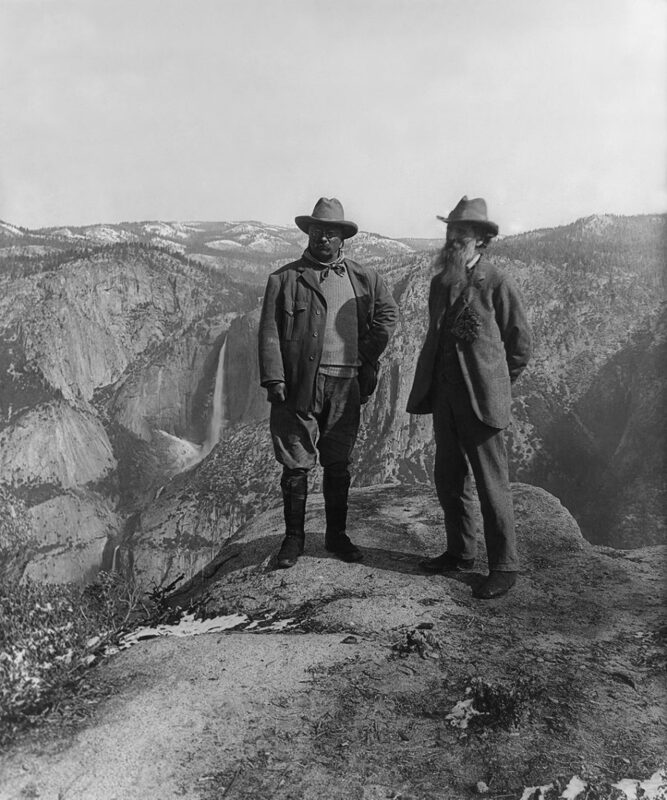 President Theodore Roosevelt and John Muir stand on an outcropping overlooking Yosemite National Park. Image by Public Domain Work. My wife and I drove south out of Flagstaff, talking, perhaps, about our jobs. We felt far from those things we wanted to do in the world. Deep snow covered the landscape to either side, a white drift below the ponderosas’ somber green and the hard blue sky. We had driven south to Phoenix before and expected the snow to melt away, the ponderosas to peter out, tall saguaro to dot the desert. Surely the way to Sedona would be the same. Suddenly the landscape broke, and our road plunged into Oak Creek canyon. Our flat, predictable road dipped into hairpin turns around crags jutting from mountainous canyon sides so steep no human could climb them. Trees clung there, tall and straight, curving up from their rock-gripping roots. We were in awe. We had not expected this near-mythical landscape, the grand drama of our tininess among sheer cliffsides standing like titans as they had for longer than our species has even existed. In the midst of it, the hugeness of it — the glory of it — existed as a thing unto itself. We would never become accustomed to this glory. Its awe was as permanent as its rocky architecture. A hiker passes through Stone Arches National Park, Utah. Image by Don Graham/Flickr, Some Rights Reserved. The term “glory” is largely relegated to theology. As translated from the Old Testament Hebrew, kabod means “weightiness,” both physically and metaphorically. We might say “significance.” It signifies another Hebrew word, hod, which means “honor, beauty, authority.” The word peppers the Old and New Testaments. It rings in hymns and spirituals. Its other home is in our talking about nature — the glory of those sights of profound beauty or imposing majesty. Perhaps, even, those utterly inhospitable places that remind us, if we will hear it, that this world has its places yet where we cannot survive. Nature’s glory, like God’s in the Old Testament, is both beautiful and deadly. Even if our affluent American society doesn’t use the term much outside of religion and nature, the substance of it is often promised in advertising. So much of our society seems to be about advertising. My wife’s and my weakness is outdoor sports stores and catalogs. We have no fewer than seven backpacks in our 500-square-foot apartment. We have probably spent more time shopping for outdoor gear than we’ve spent actually outside in any given week. Part of this is the design of the products’ marketing: broad vistas, images of that natural glory seen secondhand, with a fit, attractive person in the foreground decked in great gear. The image promises glory, a connection to that vast world. All it can deliver is the gear. Snowy peaks in Oak Creek valley in Sedona, Arizona. Image by David Leicken/Flickr, Some Rights Reserved. We may have forgotten glory, but we still seek it. We have also forgotten the name of those things which promise glory without being able to deliver it: idols. Marketing runs on idolatry. 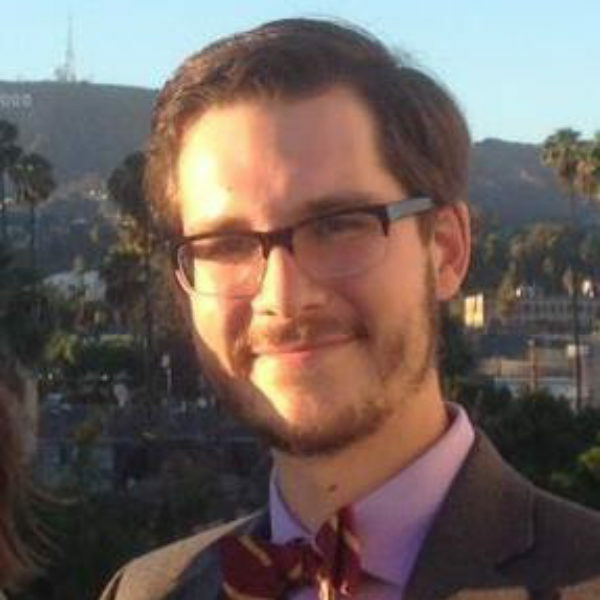 It makes items we don’t yet have signify a glory or dignity we feel profoundly disconnected from. When (or if) we acquire the items, services, trips, experiences, we find them lacking. They are unable to hold the weightiness, the significance, that belongs to something much larger than them or us. My wife and I have seen the beauty of our country in its many national parks. Walking out of the dark cathedral of Carlsbad Caverns, we were grateful that, for all the United States’ problems, it got the national park system right. Teddy Roosevelt, John Muir, and the other founders of that system knew that people needed the solace of nature, its silence and humbling hugeness, its glory. A view into the Grand Canyon in Arizona. Image by Jackson Culpepper, © All Rights Reserved. We have seen the quartz trees of the Petrified Forest, leftovers from the Triassic Period. We’ve visited the venerable Smokies. We walked in the 700-year-old paths of the Ancestral Pueblo at Bandelier National Monument. We’ve seen the Grand Canyon break into the deserts of northern Arizona. There is power in these sights that remind us how big and old and complicated the world is. Power in their silence, their vastness, their mysterious beauty that entrances the human soul. They are the glory of nature, and maybe of the divine, the significance that casts a shadow on so many of our petty mortal concerns. This is not to say that they are not also delicate, or that there is a not a reckoning to be had with this land’s first inhabitants, those who have far deeper — and disastrously disrupted — connections to it. Small as we are, it is our calling to protect these places and to reconcile tragic history among those who live here. But the river runs through Oak Creek, the river that has carved its crags in unimaginable years. We are so distracted by things (primarily to buy) and the busy chatter of living. We forget the glory, that absolute glory, that is all the more unbelievable for its generosity of beauty. We forget the stuff of deeper life, not least that it’s entirely possible that a spark of that same glory dwells in the deep cavern of our hearts. May we remember glory, and may we learn to be wary of accepting anything less. Grand Canyon National Park, Arizona. Image by Grand Canyon National Park /Flickr, Some Rights Reserved. Untamed, wild beauty kindles a yearning and an awe that few man-made structures can, even the most sacred churches, mosques, or temples. Our resident bard with a praise song for the wide open spaces that beckon us to open our hearts to all people and things before us.